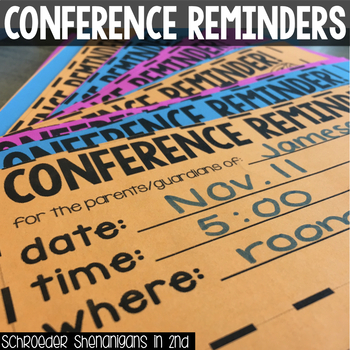 Are you getting ready for parent teacher conferences like I am?? These EDITABLE forms can help you to prepare data and comments for each student for all subject areas all in one place! For each included form, you can add your own text boxes to add student name, grades, subjects, and comments. I've also added a slide that has a completely editable table for you to make your own, set up just the way you would prefer it to be for conferences! 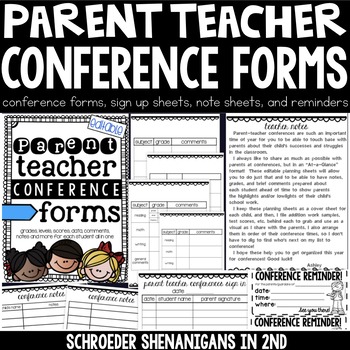 I've also added a parent teacher conference sign in sheet to keep track of who attends your conferences, a conference notes keeping page to jot notes throughout you conferences about what you need to follow up on for specific students, and a CONFERENCE REMINDER printable that you can use to send out prior to conference to remind your parents of their conference time and date! 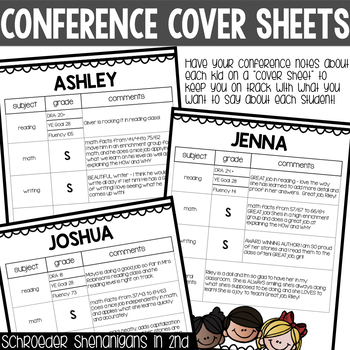 This pack ALSO includes a printable conference compliment page as well as a poster to hang for directions for students to receive a conference compliment from their parents, from you, etc! Good luck with your parent teacher conferences this year!